Super Savings Item! Free Shipping Included! 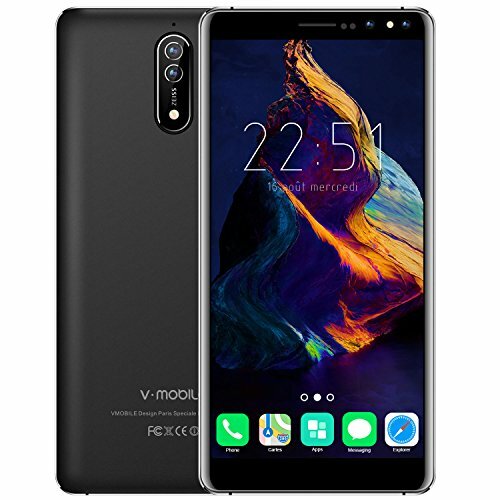 Save 39% on the Cell Phone Unlocked, v mobile N8-N Android Phones International Version, Dual Sim Smartphones with 5.5 inch HD (18:9)|1GB RAM+ 16GB ROM|Android 7.0|5.0 MP+ 8.0 MP|2800 mAh Battery| Black by v mobile at DJ Luu. Hurry! Limited time offer. Offer valid only while supplies last. PS: Before starting up the cellphone, please remove the battery and tear off the insulating film on the battery at first. Then reload the battery after the film taken off and start up your mobile phone. We guarantee customer to enjoy a 12-MONTH WARRANTY for all of the vmobile products in the store. 【Android 7.0 System】contains the most stable Android 7.0 OS to make your life more convenient and smooth. 【Dual 5.0 MP+8.0 MP Camera】allows your precious moments to be captured as wonderful memories. Let you take great-looking shots of people with a beautiful impression. 【640*1280 High Resolution Display】this smart phone is with 5.5" IPS 18:9 screen, 640*1280 pixels display, ensures you a more enjoyable experience in Movie, Game and Website Browse. 【2800 mAh Efficient Battery】can be full charged in 3 h-3.5 h and provide up to 7 days standby time and 1-1.5 days efficient for daily use. 【850mHz/1900mHz Frequency & Dual Sim】supports 3G, 2G (850mHz/1900mHz) network with Bluetooth, GPS, WiFi function. This smartphone is embedded in 2 micro sim card dual standby with 1GB RAM+16GB ROM, can balance your home life and business considerately. If you have any questions about this product by v mobile, contact us by completing and submitting the form below. If you are looking for a specif part number, please include it with your message.